<< Back to Opening Night! Taj Mahal! 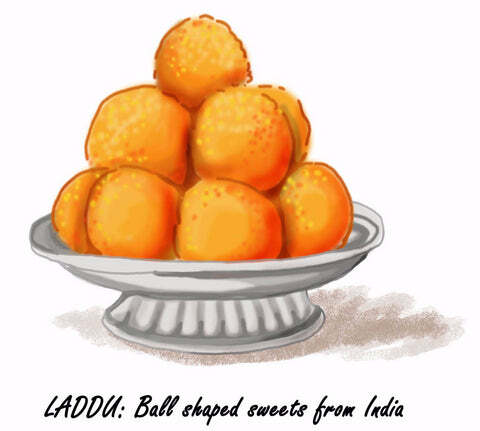 Stopping for a bite to eat at a local store, the travellers enjoyed some yummy, sweet sticky balls of flour called "laddu". According to Hari, his aunt had been able to set up the shop with money she had saved over the years. As they enjoyed their delicious treats, they overhead a customer say to Hari “You must learn from your aunt. She saved a little every month and now she owns this shop”. Mira and Teyus were completely mesmerized by the market and the hundreds of elephants, camels, monkeys and other animals they saw. Everyone seemed to be preparing for the grand opening ceremony later that day. They wondered how the King would get rid of so many bricks. Hari laughed and told the travellers that his clever King had a plan. He had promised that everyone who removed a brick, could keep it. This news had spread quickly and thousands of people had come to help break down the wall so that they could take bricks home. He estimated that the brick wall would be down in less than two hours! Teyus noticed a complex system of pulleys with an elevated track as far as the eye could see. This was obviously used for transporting heavy building materials to and from the site. He could not believe how advanced the engineering was 400 years ago. They entered a shop which looked just like a treasure chest. In front of them were the most beautiful fabrics they had ever seen. Hari introduced the girl behind the pile of colourful saris as his sister and within no time, she was draping a sari on Mira who was squealing with delight at how pretty she looked! Suddenly they heard a loud gong and they quickly followed the crowds lining up to break down the brick wall. People could hardly wait to see this beautiful building which had taken 12 years to build! Hari joined his father who was a spice merchant. They had set up a shop on the ramp leading to the wall and had made a special blend of secret spices to give people strength. The line of people queuing up to get some of these extraordinary strength-building spices curved around the market! There was so much happening at once!. While some people were breaking down the brick wall, others were moving bricks down the ramp. There were dancers and singers and vendors selling everything from statues of local Hindu gods, to bangles, to hot, sweet chai tea in clay mugs. Mira and Teyus were totally immersed in the excitement and enjoying every minute. Finally, there were only a few bricks remaining and the large cloth covering the building was ready to be taken down. At that moment, the royal announcer came to inform everyone that the King and his entourage (that's just a fancy word for the people who hang out with important people) were on their way. When the travellers caught sight of this approaching entourage, they could hardly believe their eyes. Even the elephants were dressed in gold and silver and looked as if they were going to an important party! As the King approached, the crowd became very quiet and the only sound was of a musician playing an instrument that looked a bit like a banjo. The sound pierced the air and soared over the marketplace. The melody resonated deep within the travellers and they grinned from ear to ear. Hari told them that they were hearing the "kamaicha", one of the oldest string instruments in the world. The kamaicha player was very soon joined by members of the royal band playing the "bansuri" (flute) and the "mridangam" (drums) and by several more dancers. The anticipation in the crowd was growing. People were anxious to see this magnificent building which had taken so many years to build. 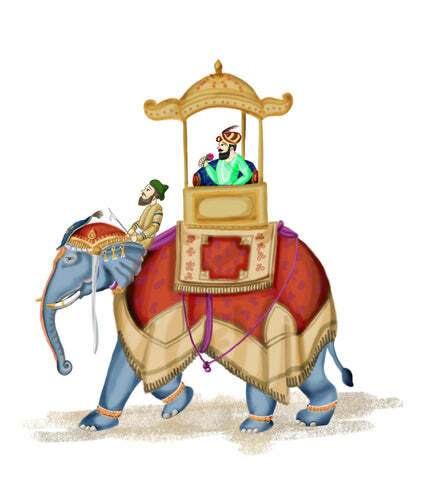 The stomps of the elephant carrying the King could be heard as he came closer and closer. The crowd threw flowers in the air to welcome him; the dancers twirled faster. The music grew louder and people clapped and cheered.